Every once in a while it’s nice to ditch the chicken breast for a different kind of protein fix. 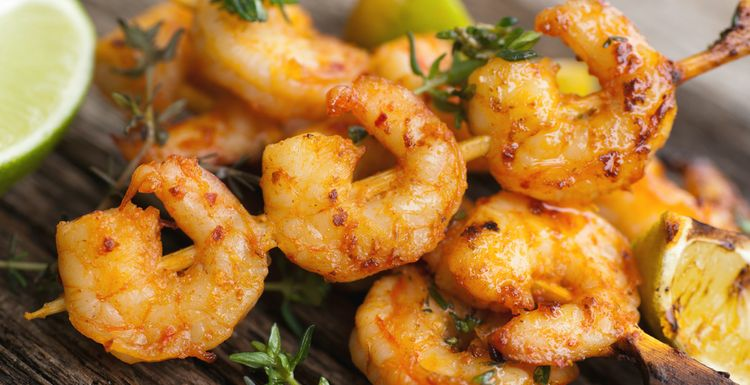 Great for bulking out a meal, prawns can replace chicken in most instances – think curries, and noodle soups, they can take heat really well so are great with chilli and hot sauces. Alternatively lemon and lime gives a perfect citrus accompaniment for these yummy morsels. Of all the cheese varieties cottage cheese is the lowest in fat and is extremely versatile. Try it in jacket potatoes, mixed with pineapple with a salad on the side, or stir into pasta. High in protein it will help to fill you up without piling on the pounds. Rich in nutrients, essential fatty acids and packed with protein eggs are hugely versatile and filling. From souffles to omelettes, poached eggs on toast or frittata, you can make a really delicious meal starring eggs to sate your appetite and help build muscle fibres. Salmon is such a healthy choice all round as it contains Omega-3 fatty acids which is great for skin, joints, and boosting brain power. So as an alternative to chicken it has a lot going for it, given that it’s the perfect form of protein and tastes delicious. From what I've been reading lately about meat and dairy, you can actually get all the protein you need from plants. I wish there was more information on it though, as it still feels like we need 'proper' protein like the ones above. Eggs are the one for me. When I was bodybuilding in the past I have eaten up to 60 eggs a week - with no ill effects! I also struggle to feel the love for tofu... prawns are delicious although I am conscious of the sustainability issue regarding intensive farming. A good free-range egg - no problem! I wish I liked tofu but I cannot get on with it. Cottage cheese however, is a real winner for me, and very versatile. I can have it for breakfast and lunch and it's not expensive at all.